I could never understand how the law enforcement would be able to make a ticket stick with this particular situation! 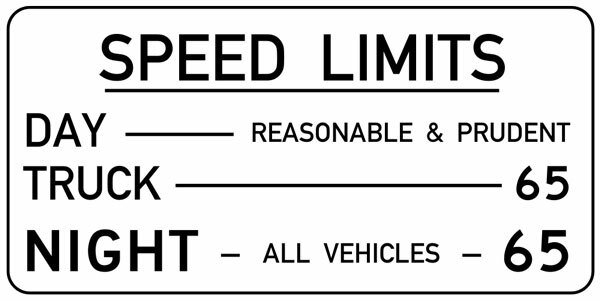 For me, I think, the biggest point is that the speed limits are really just arbitrary numbers, and don't really have all that much to do with safety. There are certainly lots of roads in eastern Montana where one can safely drive faster than 70, despite what the speed limit says ... and there are almost as many roads up in the mountains that have the same 70 MPH speed limit, where it would be suicide to actually drive that fast. So I think "reasonable and prudent" is the only way to go. The highway patrol would save more lives if they went back to that philosophy ... ticketing people who don't bother to slow down when roads get icy, for example. I drove in Montana in the 60's & 70's. Actually the "reasonable & prudent" limits worked quite well. If you were on slick roads or some other hazardous situation you were expected to slow down; if you were traveling at 90-100 mph you were not reasonable nor were you prudent! Tickets were issued and could be paid on the spot! I also think they had it right in the '50s. That's when, where, and how I learned to drive, reasonably and prudently. And it is really the 'de facto' standard everywhere. Here in Colorado you can get a ticket for 'agressive driving' for obeying the posted limit. And no one really knows what the 'grace' standard above the posted limit is. It's up to the officer to determine if you are 'R&P'.